This article was adapted from the SONAR Manchester Update PDF. 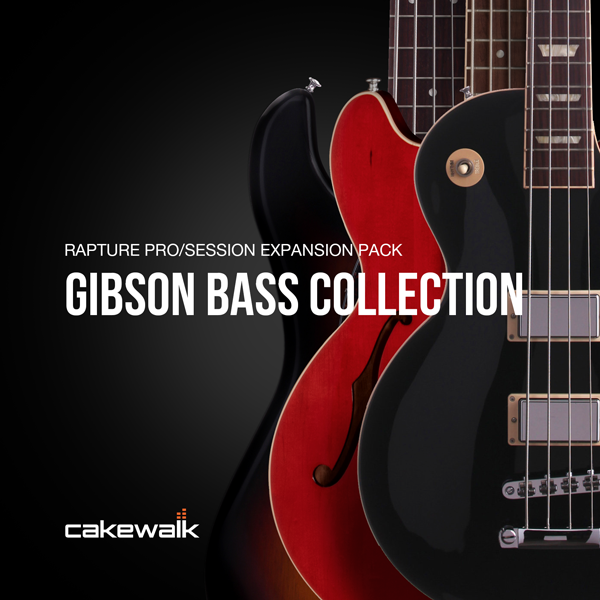 Cakewalk has introduced a new expansion pack for Rapture Pro and Rapture Session: the Gibson Bass Collection. It includes the Gibson Les Paul Standard Bass, Gibson Midtown Bass, and Gibson EB 5-String Bass 2.0, an updated and enhanced version of the Gibson EB 5-String Bass pack originally created for Dimension Pro. I’ve been asked to write a bit about how they came about…so here’s the scoop. First of all, why three basses? Simple: I’m about 300 feet away from the World’s Greatest Lending Library for Guitarists—the Gibson USA factory! Several people at Gibson told me they thought the Les Paul Standard was the best Gibson bass ever, so I borrowed one. Its deep, powerful tone was very different from the EB 5-String bass I normally play. Its tone was made for not just rock, but blues and country. Why Sample a Bass if You Can Play One? Good question. Because I’ve played bass for years, people are sometimes surprised I often use keyboard bass in my own productions. That’s because to me, they’re different instruments: Basses are wonderful, but they don’t hook into synthesis modules like a keyboard bass can. This means that keyboard basses involve an element of sound design that makes it easy to tailor them for specific projects. But, I was never a fan of either multisampled basses because they sometimes felt too much like I was “assembling” parts, or standard synth bass sounds that lacked the organic quality of a physical bass. Besides with multisampled basses, after all these years of practicing to avoid finger squeaks and fret buzzes, it seemed weird to put them back in on purpose! So, my solution was to sample real basses, and then use synthesis to allow the bass sounds to respond to dynamics. The sounds were sampled with a fairly heavy pick attack for consistency but once those are captured (not a trivial process), then the Modulation Matrix is key. Inside Rapture Pro/Session, velocity not only controls level, but raises filters somewhat from a base value to emulate the brightness that happens when you hit a string harder, and also affects sample start. At low velocities, sample playback begins after the hardest part of the pick attack; hitting the key harder brings in more of the pick sound. Each program also has a keyswitched articulation to flip between two sets of .SFZ files (these are the files of code that map samples to the keyboard, as well as control sample parameters). The “pick” articulation works as described above; the “thumb” articulation emulates a finger attack by stopping sample playback just short of the pick attack at high velocities, and adding a slight attack time. By hitting the lowest C below the existing notes, you can alternate between the two. Programs in the packs that contain this functionality are called “Pick” programs. A second set of “Thumb” programs offer a different articulation. The main articulation is the thumb/finger one, while the second adds a quick, percussive detail. It has a certain synth-like quality that works well with alternative musical genres. The Midtown and Les Paul Standard basses have six total programs, two (Pick and Thumb) for each pickup combination—Bridge, Neck, and Neck + Bridge. The EB 5-String Bass 2.0 has eight pickup combinations and eight unique sounds, thanks to the Tune Coil Tap concept perfected by Gibson pickup guru Jim DeCola. As a result it has 16 program (and of course, needs a lot more samples). All of them also have sampled up and up/down slides, which adds a whole other element. These basses have some unusual twists. With the Midtown and Les Paul Standard, I wanted the notes to go down to the 5-string range. So, I transposed the low E digitally to create “new” samples (not just transpose with the instrument mapping) until I had enough to cover the needed note range. Also, all the files in use the .FLAC format to reduce the memory footprint and load times. Most instruments are around 200-300 MB, and typically load in 2 seconds or less from a hard drive. But the Big Deal involves Rapture’s Instrument controls, and programming these probably took 80% of the pack development time. Each of the basses has the same control complement, so if you’ve learned one, you’ve learned them all. Here are the 12 controls. 8-String – adds a second, octave-higher layer to provide an 8-string bass effect. This layer has an 18 ms delay compared to the primary layer, which gives the distinctive sound of a pick hitting the octave string after the fundamental string. Suboctave – this uses a wavetable (Sine Cube) to generate a synthesized sound an octave below the main layer. TouchFilter – this keys a resonant filter to velocity, so you get “touch wah” effects as you play. It’s quite electronic-sounding. Growl – uses Rapture’s internal DSP to add a little grit. Chorus Rate and Chorus Depth – with minimal Rate, increasing depth adds stereo width. Of course, you can also use this to provide chorusing effects. X/Y Pad 1 – the X-Axis controls vibrato depth, the Y-Axis controls frequency. Given that bassists rarely use vibrato, this can add a very “synthy” vibe. X/Y Pad 2 – this is effective only if the 8-String layer or Suboctave is turned up, because the X-Axis adds distortion to the 8-String layer, while the Y-Axis adds distortion to the Suboctave layer. Unlike Rapture Session, Rapture Pro includes a Mixer section. Its two sends are assigned; Send 1 introduces temp-synched delay, while Send 2 feeds an LFO filter. I’ve often mentioned that I initially design the effects and instruments Cakewalk releases for my own use, and these basses are no exception. Even the people at Cakewalk were surprised by the sonic differences among them—the aggressive, big sound of the Les Paul Standard Bass; the warm, rich, sound of the Midtown Bass, along with its distinctive “snap” that adds brightness; and the clarity of the EB 5-String, thanks to the swamp ash body and the versatility that results from the clever passive pickup wiring. I’m happy to share them with you, and hope you find them useful in your own music. Will Cakewalk software run on my computer? I'm having a technical issue with my product. Where do I find Cakewalk Technical Support?